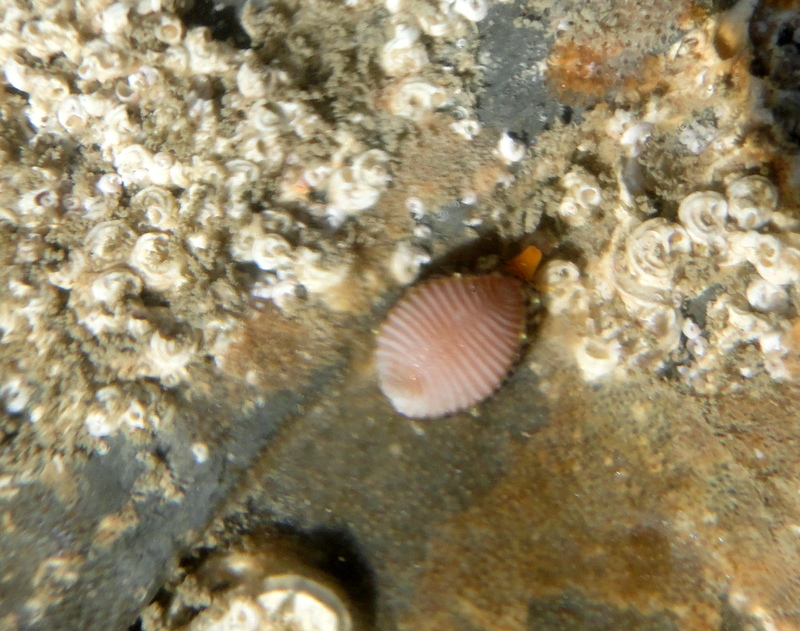 Occasionally you find something in the rock pools that makes you want to shout it from the cliff tops. This is one of those moments. I was hoping for some interesting finds at this spectacular rocky cove, but this little overhang is hiding something magical – a large colony of Scarlet and gold star corals. It’s the first time I’ve seen this species at Porth Mear and it’s not easy. Waves are crashing through a deep channel to my left and splashing up my leg and I’m standing in boot-depth water, trying to lean down and peer through a slit opening in the rock at knee height. My camera won’t fit through the gap in its waterproof casing so I have to chance it and put it in unprotected, holding it just clear of the waterline. My hair dangles in the pool, seaweed brushes my mouth and my right boot fills with icy water, but nothing will stop me. I count at least 30 cup corals in the nearest part of the entrance, but many more orange blobs sparkle in the darkness further back. 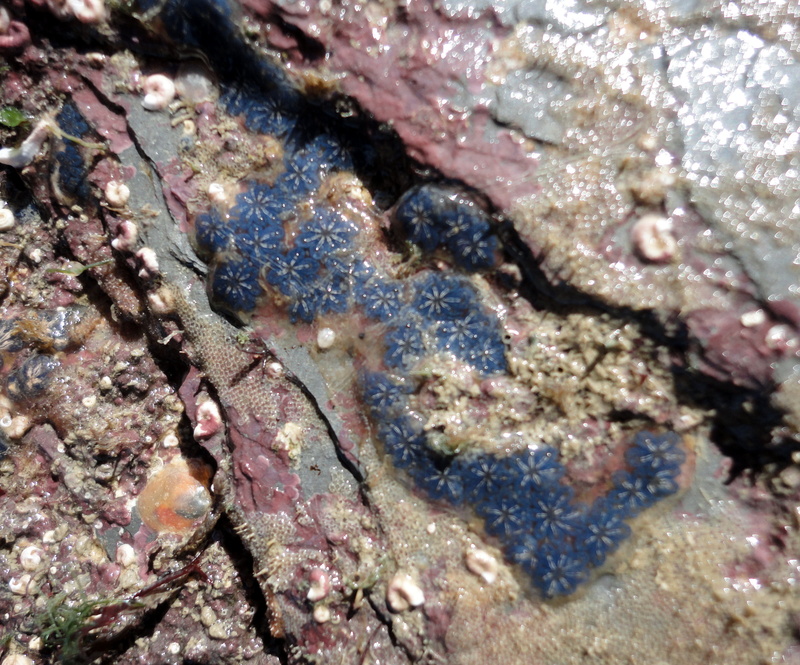 All three generations of Cornish rockpoolers are out on the shore today. My mum, my other-half and my son all take turns manoeuvring themselves to get a view of these bright orange and yellow treasures. Cup corals love these wave-splashed environments. There must be others around here, but the fierce Atlantic waves rarely give access to the places they might be. 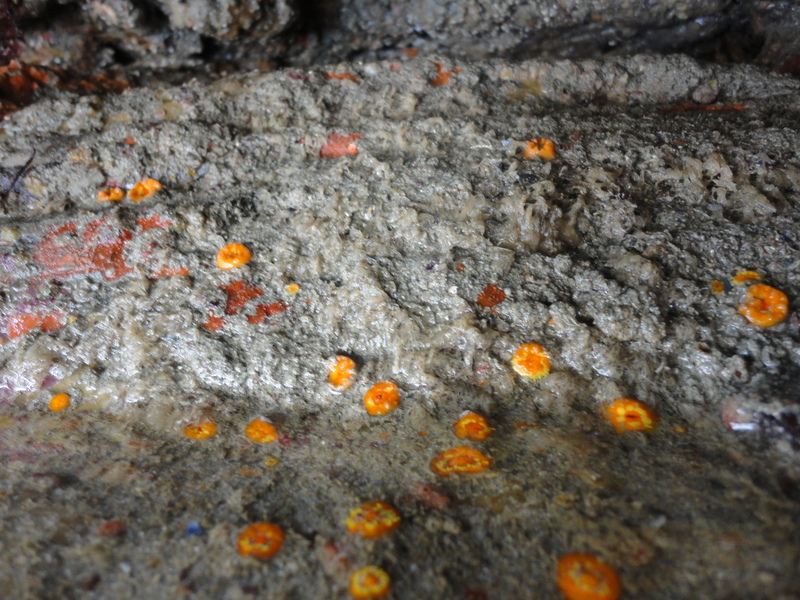 These small stony corals close when out of the water. I can make out the ridges of the calcified skeleton and the vivid colours, but the spotted, yellow-tipped tentacles are hidden away. It’s amazing to me that this beach, which I’ve been visiting since I was a small child, just a couple of miles from where I grew up, can still harbour such secrets. There’s more to come. As we start to move back up the shore we find a perfect Cornish clingfish specimen. 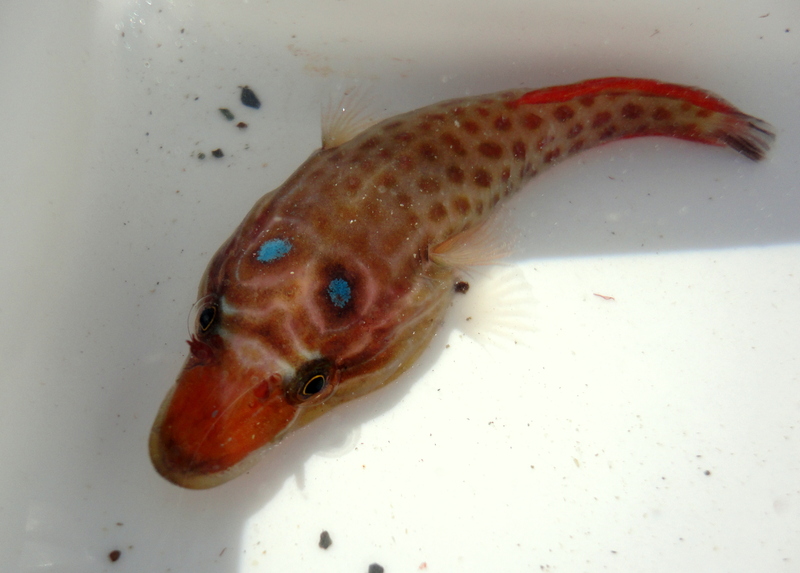 The blue spots on its head glow in the sunshine, behind its head tentacles and duck-billed mouth. It grips tightly to the tray while I photograph it and is holding on so tightly I wonder if I’ll manage to release it before the tide comes in. Eventually it swims away. 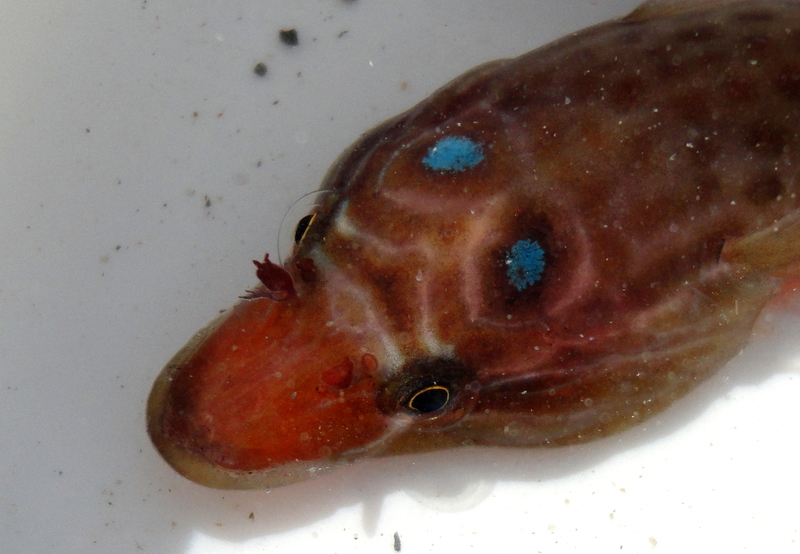 Cornish clingfish close-up showing nose tentacles and blue spots on the head. 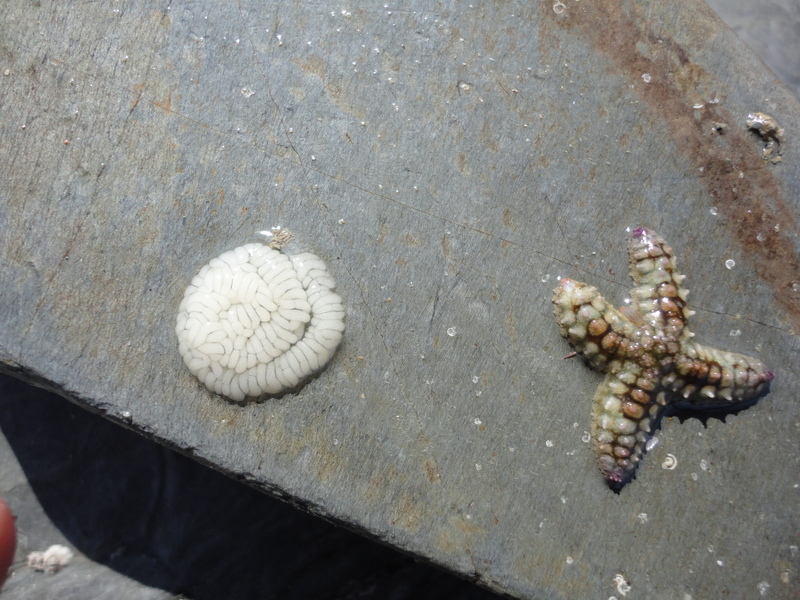 My mum finds a spiny starfish with four arms and a spiral of sea slug eggs on a small rock. 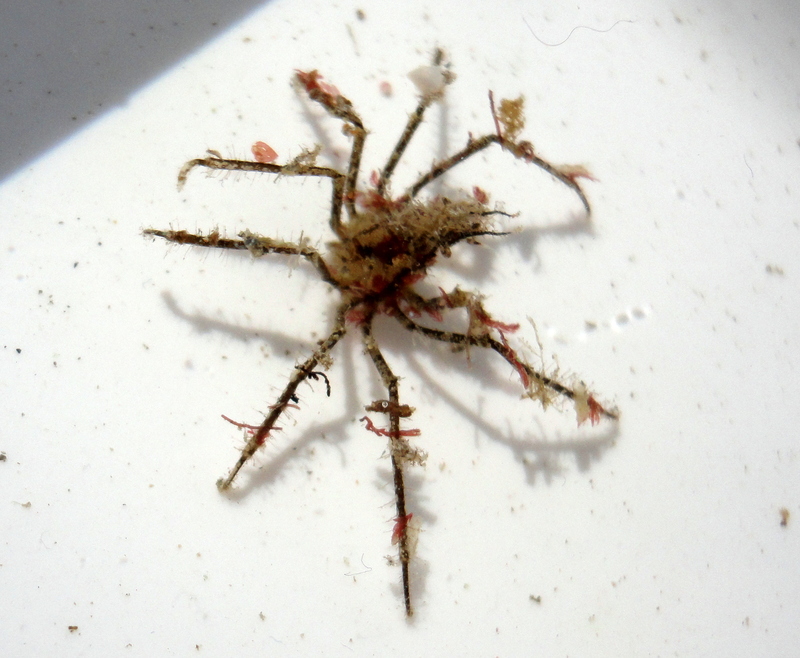 My other-half shows me a minute spider crab he’s found, so well covered with pieces of seaweed it’s attached to itself that it’s perfectly disguised in the pool. 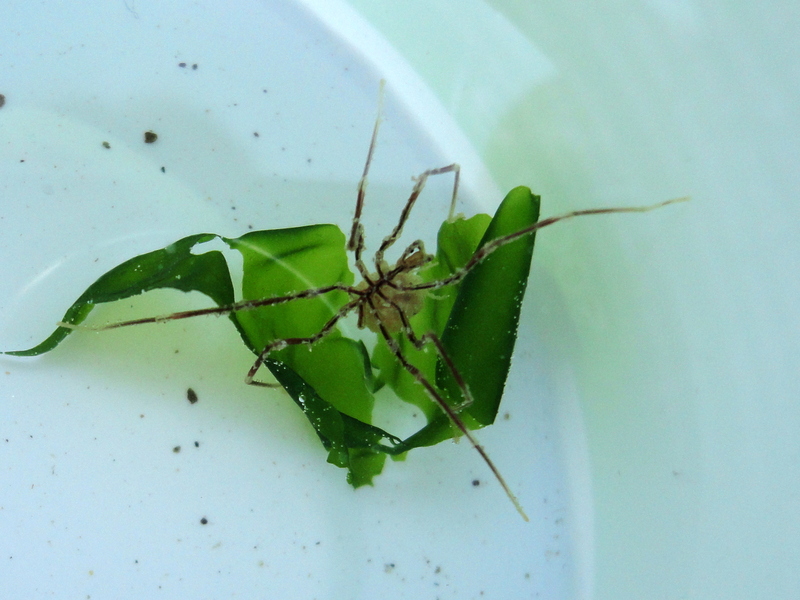 As I move a rock, I notice a small movement and scoop up a beautiful sea spider. These wonderful little creatures are in a phylum all of their own and are not arachnids like land spiders. They seem unsuited to life on the harsh Atlantic coast. They are barely able to swim and seem far too delicate and spindly to cope with waves and currents, but somehow they do. 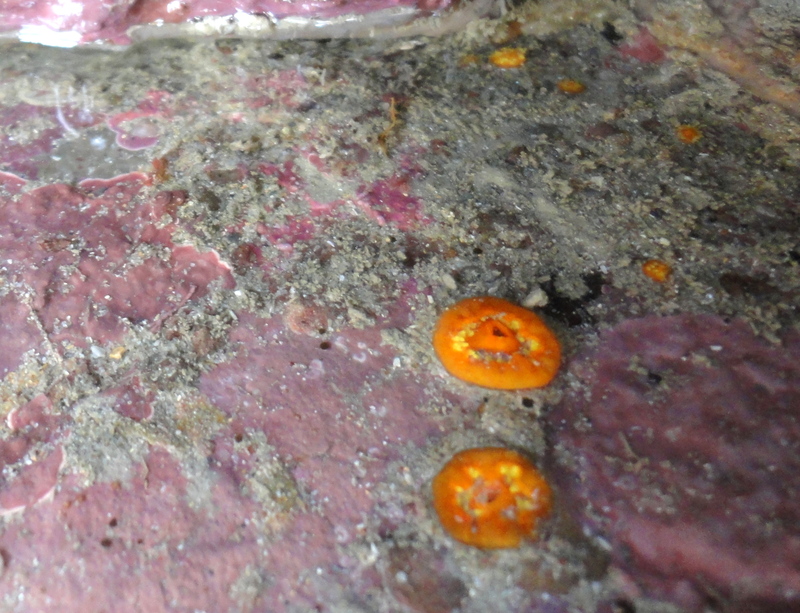 I film the sea spider swimming in the tray as a sea lemon crawls around the edge. The tide is coming in now so we quickly return it and head off for a well-earned picnic. These tides have uncovered some amazing secrets in a place I thought I knew well. I’m left wondering what other treasures remain to be discovered here. I might’ve said this before at some point, but I’ll say it again anyway. 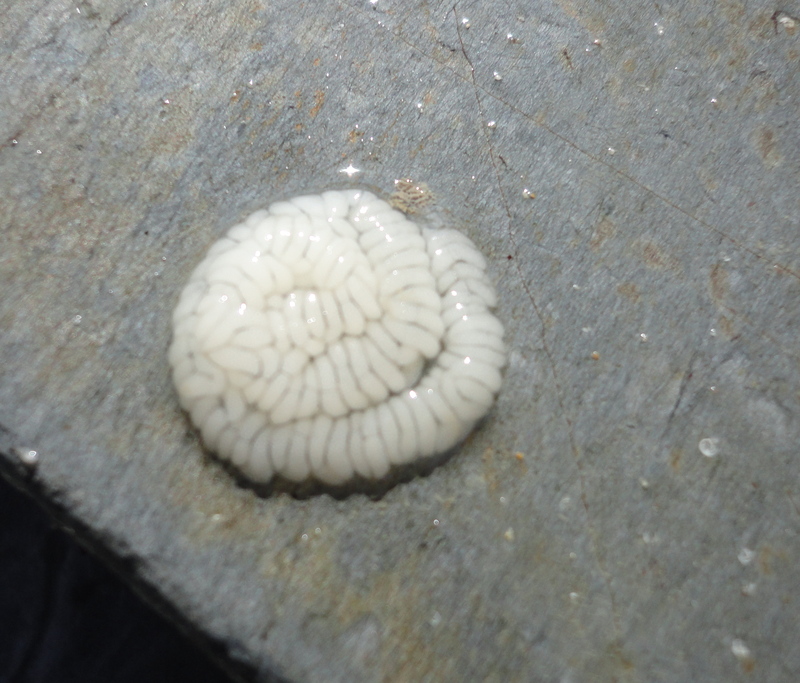 I abso-bloomin’-lutely love reading your rock-pooling blogs. They are fantastic, thank you. Thanks so much, Nik. I love writing them, but comments like this make the wet feet, frozen hands and nights spent staring at spider crab keys well worth the effort. Keep me updated on your finds too. Will do! 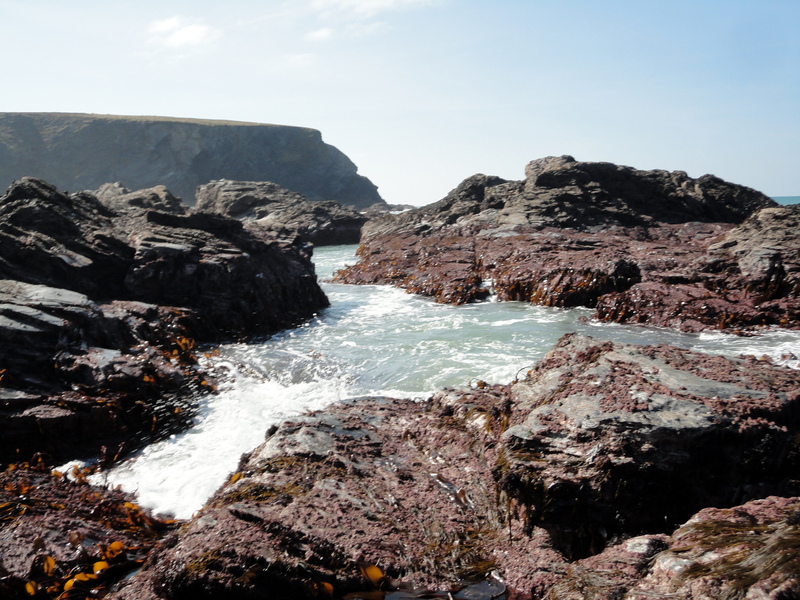 The super-low tides were a liiiittle bit disappointing where I currently am in Wales. Found some of the usual suspects, though even they seemed few and far between, and didn’t stumble across anything particularly mind-blowing, alas. Next time! Moving to Bristol soon, so I’ll have to make the most of any limited rockpooling opportunities I get elsewhere, and live vicariously through your posts! Echo the previous comment – your enthusiasm oozes all over the page. Would love to join you one day on a ramble. is that something you do? Thanks, Pat. We’re so lucky to have all of this wildlife on our doorstep, aren’t we! I’m always very happy to go rockpooling with keen and lovely people, so drop me a line on Facebook or Twitter if you have an idea of where or when. I volunteer with Cornwall Wildlife Trust and Looe Marine Conservation Group doing just that, but happy to go for a potter some other time. I don’t offer tours commercially because the health & safety/ insurance side of it blows my mind.